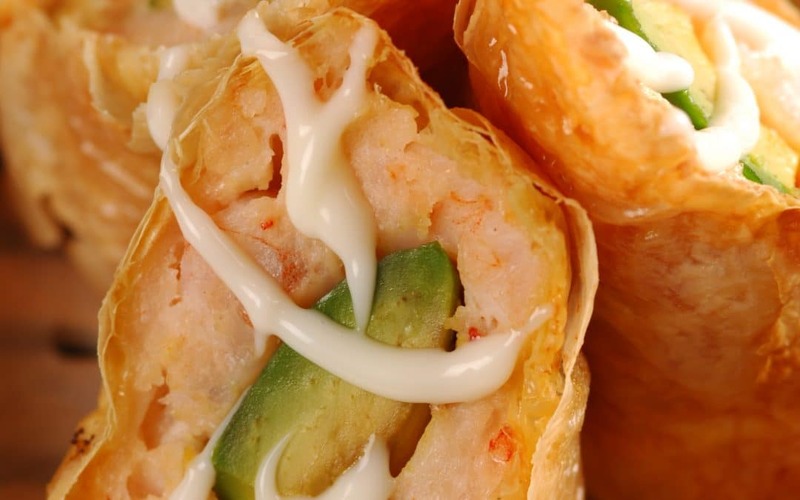 Sydney Asian restaurant Zilver, has given us their tips into making these yummy-looking deep fried prawn and avocado rolls…. Mix the salt, pepper, sesame oil and sugar all together with the prawn mince. Cut the avocado into thin wedges. Cut the bean curd sheets in 20cm x 20cm squares (although it does depend on the size you want). Place the wrapper like a diamond, in such a way that the one corner is facing you. Take a scoop of one tablespoon filling – a thin layer of prawn mince mixture on top of the bean curd sheet and then place an avocado slice on top, then form this into a log shape. Fold it away from you then halfway through fold the two sides in. Continue rolling then brush the outer edges with a little egg white to seal the ends. Deep fry for 10 minutes, cut the roll in on an angle, and drizzle with mayonnaise to taste.